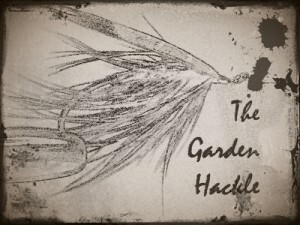 Here is the Garden Hackle. We hope to see you at the meeting. Among fly anglers, the term “tied in parachute style” can elicit a variety of emotions. While there surely are a few freakish masochists who relish the opportunity to tie a dozen parachute flies, I would think the majority of tiers are left squirming with anxiety at the thought of tackling this seemingly impossible task. Yet we push on, and fumble our way through a few flies for our next trip. Inevitably collapsing posts, trimming away hackle fibers caught in a whip finished head, and muttering under breath. Why do we do this? I think the majority would also say that parachute style flies are a necessary evil, if you want to catch more fish that is. While the thought of tying such flies may leave you wincing, the thought of fishing such flies will leave you glowing with the wonderful memories that only dry fly fishing can leave. This notion rang true early in my fly fishing journey, on a productive lake atop a well-known southerly passage. It is a trip that always comes to mind whenever I think of the parachute style fly. Most would agree that fly fishing has a somewhat steep learning curve. For me, that curve was amplified when I randomly decided to pick up fly fishing. With only a few books from the library and the little information (at the time) that I could find online, I would set out by myself fishing the local Bellingham area. Most days were an exercise in futility, but sometimes I would catch a few small perch or something that would at least quell any frustration and hopelessness that I was feeling. This pattern went on for a year or so, held together by, yes…a freakishly masochistic sense of stubbornness. While back home for spring break, my mother introduced me to a friend of hers from her Rotary group. She had overheard him talking to someone about fly fishing and thought it would be great if he could give me a few tips. A few days later I was heading up the pass to a lake I had never heard of, and listening to this gentleman talk about gear, bugs and techniques that I was still confused about. My host was exceptional and very generous. He provided me with a pontoon boat, a box of flies and an extra rod. As we approached the lake he told me the areas I should concentrate on and showed me how to rig up a technique that I later would know as chironomid fishing. The day started just like most of my fishing had, untangling leaders and figuring out how to cast this ungodly setup. I quickly gave up and tied on an elk hair caddis. My first cast, I got a swirl! Then the inaction resumed. My friend, seeing my frustration kicked over to me and asked me what I was using. I told him, and in a half-cocked smile he said ‘why don’t you use what is landing on you. Remember the Callibeatis hatch I said to watch out for?’ I dug out my loaned fly box and stared. ‘Use a parachute Adams.’ He said as he kicked back to his spot. From then on I was hooking fish that I had previously only seen in magazines. My jaw would drop as I watched the water turn silvery under my size 14 parachute Adams. The fishing continued at a pace to where I expected a rise with every cast. I still however was plagued by my inexperience. The half dozen or so parachute Adams that my host had so kindly tied for me had dwindled away, due to my poorly tied knots and clumsily fought fish. I tied on the closest thing I could find in the box, a standard Adams with a full hackle. After that the fishing didn’t just slow, it stopped! I got a few “looks” but nothing else. It was a moment that truly clued me in on the sometimes subtle differences between success and failure as an angler. At some point during the hatch I had an idea to cut off the bottom part of the hackle on my Adams. To my amazement the fish responded. I was hooking a fighting fish again, all because of a few snips of hackle. That trip was a turning point in my life as a fly fisherman. It gave me valuable insight and recharged my enthusiasm and drive as an angler that has never left me since. Since then my fly box has never been without a parachute Adams. 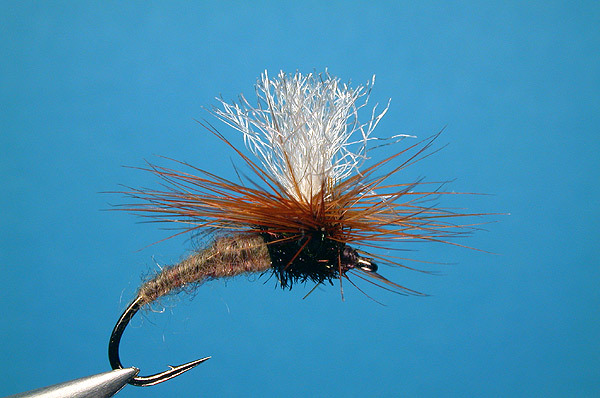 I have also added this parachute fly to my angling arsenal, the Klinkhåmer Special. This fly was introduced to me by Tom Bolender after sharing this story with him. He said if you’re going to fish a parachute adams, might as well make it a Klinkhåmer Special, its sort of like a belt and suspenders. The Klinkhåmer has proven very effective in many situations were mayflies were present. 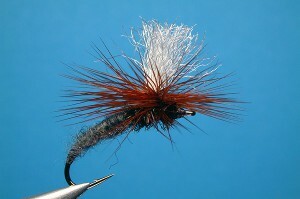 The originator Hans van Klinken has a very good write up about his fly at http://www.danica.com/flytier/hklinken/klinkhamer_special.htm. I will let him explain how to tie it since he does an excellent job. His parachute technique may also help subdue any anxiety about tying parachute flies for your next outing!